Tuesday, March 19, 7:00 p.m. In recent decades, universities have turned increasingly to the use of poorly paid instructors on short-term contracts without any job security. Today a majority of university classes are taught by these workers. Since the 1970s, precariously employed university workers in Toronto have organized to improve the terms of their employment, first in the Graduate Assistants Association, then the Canadian Union of Educational Workers, and finally in the Canadian Union of Public Employees. They have bargained hard to win some decent working conditions, often having to engaging in long, bitter strikes to make any gains. Deborah Littman, Roland Nelson, and Richard Wellen were active in those campaigns at Ryerson University, the University of Toronto, and York University, and will talk about their experiences in building unions on these campuses. Stephanie Ross, a professor of Labour Studies, will discuss the broad trends of precarious academic labour. Join us for a lively and important discussion. Steelworkers Hall is a wheelchair accessible space. Parking is available in the lot behind the hall on a first-come first-serve basis (enter through laneway east of hall). There is also paid parking available on the street. The closest transit stops are Spadina and Nassau (510 Spadina Streetcar) and College and Beverley/St. George (506 Carlton Streetcar). For any other accessibility questions or concerns, please contact Ed Dunsworth at edunsworth@gmail.com. 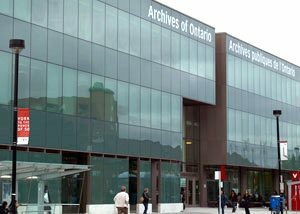 The Archives Committee has organized a tour of the Archives of Ontario (located on York University’s campus) for TWHP members on May 28th at 1 pm. For more information and to RSVP, contact Elizabeth Novak at elizabeth.novak61@yahoo.ca. Tuesday, February 12, 7:00 p.m. RESCHEDULED due to weather. Please note the new date below. Tuesday, February 19, 7:00 p.m. This film focuses on the labour organization of Italian immigrant workers in the residential construction sector, known at the time as “the jungle” due to its terrible working conditions and widespread exploitation by developers and (sub)contractors. Led by the charismatic Bruno Zanini, a petty criminal and aspiring opera singer-turned-labour organizer, and the thundering Charles Irvine — a shillelagh-wielding Scottish immigrant who was once a banana boat worker — bricklayers, plasterers, carpenters, cement masons and labourers, organized as the Brandon Union Group, engaged in two major strikes in 1960 and 1961 – the latter being one of the largest and most violent in the city’s post-war history. The film will be introduced by its producer and director, Gilberto Fernandes, director of the Portuguese Canadian History Project and post-doctoral fellow at the Robarts Centre at York University. From our November meeting on the Metro Days of Action. Tuesday, January 8, 7:00 p.m.
Sports have long been a crucial expression of working-class cultures and experiences. 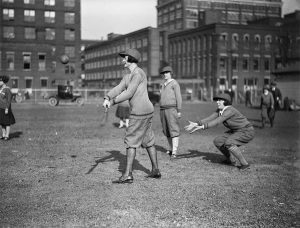 Many workers played sports as a leisure activity after a long week on the job, and sports clubs and teams were often important branches of political, ethnic, or religious organizations. Sports have also been the site of struggle. Working peoples have fought for the right to play sports and access to spaces in which to do so. Immigrant and racialized communities have pushed for inclusion in sporting cultures and to secure a place for their own games within the broader sports landscape. At the same time, sports have sometimes been viewed by bosses and social reformers as an ideal training ground for imbuing working-class people with industrial discipline. Join us to hear two exciting presentations on the history of workers and sport in Toronto, followed by a Q&A. Janelle Joseph is the author of Sport in the Black Atlantic: Cricket, Canada and the Caribbean Diaspora (2017) and the co-editor of two books, including Race and Sport in Canada: Intersecting Inequalities (2012). She is an adjunct faculty member at the University of Toronto, where she is also the Director of the Academic Success, Student Life and the Assistant Director of the Transitional Year Program. Bruce Kidd is a Professor in the Faculty of Kinesiology and Physical Education at the University of Toronto. He has authored or edited 12 books and hundreds of articles and other works, including The Struggle for Canadian Sport (1996) and Historicizing the Pan American Games (2017, co-edited with Cesar Torres). He is an Officer of the Order of Canada. Video from our meeting on the Metro Days of Action, 12 November 2018. Tuesday, December 4, 7:00 p.m.
Join us for an evening of fun and building towards TWHP’s 2019. At 7:00pm, we will hold our Annual General Meeting, featuring reports from the Executive Committee, Treasurer, and Archives Committee. We will also elect the Executive Committee for 2019. All are welcome to the AGM, though only TWHP members in good standing may vote. 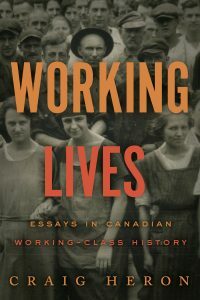 At 7:30pm, the general programme will begin, featuring a book launch of Craig Heron’s Working Lives: Essays in Canadian Working-Class History and music by Raspberry Jam, followed by refreshments and conversation. Join us! Facebook event here. As co-instructors, we are currently teaching a course on the history of women and work. Our primary concern in this course is to have students think historically about women’s lived experiences under capitalism. We explore how things looked in the past, how they were transformed over time, and, in turn, why they look the way they do today. By teaching in this way – pulling history into the present – we aim to re-center the enduring struggles of women to create a better future. Moreover, we try to dismantle the notion that gains are bestowed on societies through benevolent states or the calm functioning of legislative powers. Whether it be suffrage, equal pay, women’s liberation, gender parity, the right to choose, sexual harassment legislation, or LGBTQ2 rights, all were widely disparaged yet courageously fought for through the direct action of women and their allies. The struggle for maternity leave by the Canadian Union of Postal Workers (CUPW) serves as a particularly powerful lens through which to analyze these themes. By the 1980s, the union began to push seriously for the inclusion of maternity leave as a core bargaining demand. The Treasury Board of Canada Post, with whom CUPW was negotiating, as well as the government was worried about the spillover effects. If Canada Post agreed to paid maternity leave, then other government departments, and even the private sector, would be forced to follow suit. 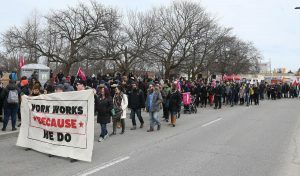 With negotiations going nowhere, CUPW went out on strike. Their demands were multifaceted, but maternity leave was singled out by capital, media, government, and the public. In turn, maternity leave was deemed egregious, unnecessary, and even greedy. Risking it all, postal workers and their allies fought for forty-two days and won. Their victory reverberated across Canadian society. 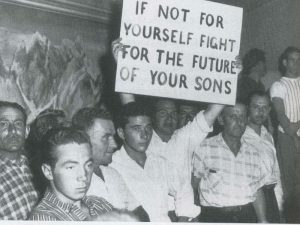 Other unions quickly followed suit and, before long, the government institutionalized and expanded maternity leave to equalize the playing field. What started out as a gain for postal workers quickly turned into a gain for all Canadian women. It’s important to recognize the spirited efforts of CUPW members during the strike to illuminate that progress doesn’t happen without struggle and courage. But it’s even more critical to shed light on how the 1981 strike was demonized. This is in stark contrast to how maternity leave is presented today – a fundamental right to be enjoyed by all Canadians. Indeed, it’s even commonly referred to as a “Canadian value” that differentiates us from our southern neighbours. In our course, we think about what accounts for these kinds of shifts in societal thinking. How was maternity leave reconceptualized from a “greedy demand” into a core Canadian tenet? We also explore the problems and consequences of these mythologized understandings. What is conveniently forgotten in current conversations about maternity leave? How does this impact the narrative surrounding strikes and the way in which they are understood? With a postal strike looming, it’s worthwhile to challenge the depoliticized accounts of gains made on the picket line. How many people have enjoyed maternity leave without knowing its history? How about the weekend or the eight-hour day? Pensions? Minimum wage? So many things that we now see as normal, even integral, parts of society were gained in this way. Yet the strike continues to be framed as fruitless, unruly, and inconvenient. Mikhail Bjorge earned his PhD in History at Queen’s University. Kassandra Luciuk is PhD Candidate in History at the University of Toronto. They are currently teaching a course in the School of Labour at George Brown College. Together, they would like to thank Kim Smith, Elaine Knight, and Jeanie Campbell for their participation in the course and for their longstanding activism on behalf of all working people. Jane Pulkingham and Tanya van der Gaag, “Maternity/parental leave provision in Canada: we’ve come a long way, but there’s further to go.” Canadian Woman Studies, vol. 23:3-4, 2004, 116-125. Julie White, Mail and Female: Women and the Canadian Union of Postal Workers (Toronto: TEP, 1990). Leslie Nichols, “Alliance Building to Create Change: The Women’s Movement and the 1982 CUPW Strike.” Just Labour (2012:19), 59-72. JC Parrot, My Union, My Life: Jean-Claude Parrot and the Canadian Union of Postal Workers (Halifax: Fernwood, 2005). Canadian postal workers have a long tradition of militancy. During the Great War, postal workers staged a nation-wide general strike for higher wages and better pay despite a wartime ban on strikes generally, and for public servants specifically. In 1965, they led wildcat strikes against sexual harassment and for better pay. In fact, the wildcats of ’65 were the main reason why the Canadian government institutionalized collective bargaining for public servants in 1967. By the 1970s, the relationship between the union and management (and by extension the government) was especially poor. 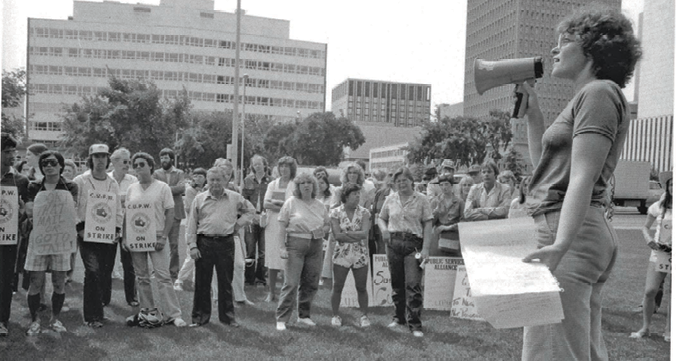 Not only did CUPW members come under state surveillance, but in 1978 CUPW’s then-President Jean-Claude Parrot was sent to jail for refusing a federal back-to-work order. “Well, what’s wrong with that?” responded Parrot. Not even the Canadian Labour Congress initially supported the militant democracy exhibited by CUPW. Save the date for our annual general meeting: Tuesday, Dec. 4 at Steelworkers’ Hall. Stay tuned to our mailing list for the exact time and further details. From our monthly meeting on 24 Sept. 2018. Indigenous people from across Turtle Island. Mississaugas of the New Credit First Nation.